1. Yet another successful Arts in the Heart is in the books. If you’ve never been, mark your calendars for next year. It may seem like a lot of people, but the crowds are manageable, and the food lines move quickly. 2. 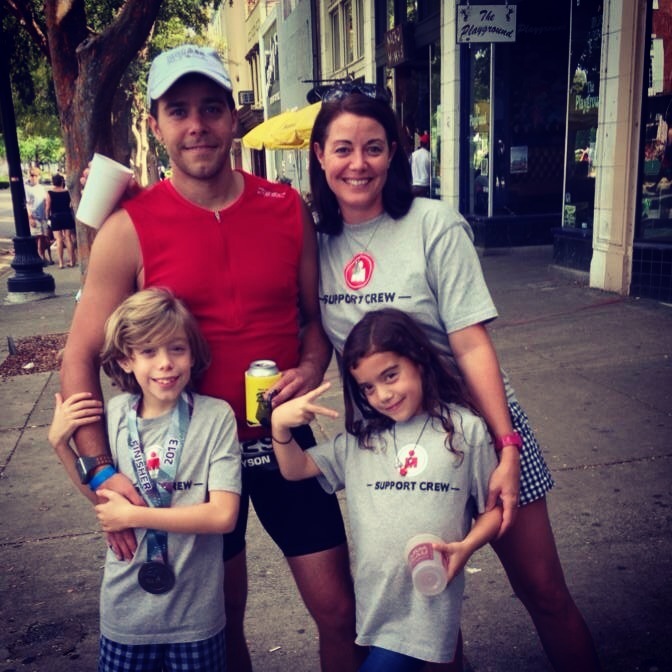 The Man completed his second half Ironman this weekend, right here in our little downtown. Parking was a breeze, the weather was gorgeous, and the athletes were impressive. 70.3 miles is no joke! 3. It wasn’t his first, and it probably won’t be his last, but I still cried happy tears. I didn’t compete, and I probably never will. If you can’t be an athlete, be an athletic supporter. With beer. 4. Did you know Augusta hosts the largest half Ironman in the world? Nearly 3500 athletes and their trainers and families were here. Many of the remarked about what a great place we have, and how there’s such potential. Let’s make it happen. 5. We went car shopping this week. What’s usually such a painful process went pretty well. No one was too salesmanny or pushy. If you want a great experience, go across the river to Bob Richards Toyota. You can tell ‘em I sent you. 6. The only glitch in the process happened the day after we bought it. I had a loaner, because mine was having some adjustments made. Minutes after pulling in the driveway with the borrowed car, the battery was dead. There were 16 miles on the car. Fortunately, the people at the dealer were at my house within minutes with another car. 7. When we left my old car, I was sadder than I care to admit. I’ll do it anyway. I didn’t cry or anything, but I felt so bad for the car. It was a wedding gift from my husband 11.5 years ago. It’s the only car my children have known. Because we tend to keep cars for a significant number of years, I was attached. The Girl wept a little in the dealership and had her picture taken with the old car. We waved goodbye as we pulled out of the parking lot and talked about the fun trips we’d taken in it. Once we were about a mile down the road, she’d all but forgotten the ol’ Escape. 8. Several ten of you have asked about my garden. After a very rough (dead) couple of weeks, it seems we have a little rejuvenation. We collected two (!) tomatoes from the Roma vine. The cucumber plant is flowering again. Because of my inexperience, I don’t know if these are just bonus blooms, and it’s too late in the season for vegetables, or if we’re looking at another crop. 9. Either way, I’ll probably try again next year. I’m determined to make an entire salad out of stuff from my yard. This year, we got an entire bite. 10. This weekend, Augusta presents the Westobou Festival. Don’t miss out. There truly is something for everyone. We’ll even have a ball pit and a ferris wheel. 11. The Mark Morris Dance Group, performing at the Imperial on Saturday night, is a world renowned ballet company out of Brooklyn. Don’t let the word “ballet” scare you away, guys. You’ll be impressed. 12. The Color Run is Saturday morning. Even if you aren’t running, come downtown to watch. There’ll be a DJ and beer at the Old Richmond Academy until 3pm. Free to get in – beer costs extra. 13. My garden update is only slightly better than my running update, but I have good excuses. Being sick for so long prevented any physical activity. I’ll be down there for The Color Run, but don’t expect too much running. In fact, if you see me running, you should pick up your feet too. There’s probably something really scary coming up behind ya. 14. Tickets are going fast but still available for most Westobou events. Visit http://www.westoboufestival.com for prices and more information. 15. Cheers. It’s fall, y’all!